VERDE UMBRIA - A Montefalco, nelle terre del Sagrantino, al Ristorante Olevm è possibile trovare la sintesi perfetta delle tipicità umbre, poiché i piatti proposti sono tutti a base di olio extravergine locale. Da provare gli strangozzi al culo mosso, l'antipasto oleum, i bocconcini al Sagrantino e il dolce Sagramisù. VENDITA AL DETTAGLIO - E’ possibile degustare e poi acquistare i prodotti locali presenti nel locale. Un consiglio: portatevi a casa scorte ingenti di olio nuovo, Sagrantino e Trebbiano spoletino. AMBIENTE RAFFINATO - La location è esclusiva ma i posti sono limitati. 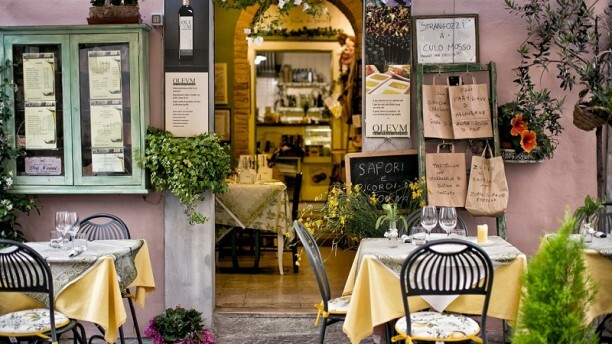 Pertanto, si consiglia di prenotare per gustare al meglio le prelibatezze della bella Umbria. Warm atmosphere; ideal for a couple. Very friendly Owners / personnel and above all excellent dishes; compliments to the team in the kitchen! Fantastic food, fresh and authentic. Wonderful service! Highly recommend. Great food and service. Perfect example of fine Umbrian cuisine. A true gem of a little restaurant. The service was fantastic. They had our table all prepared when we arrived. They cooked a special dish, not on the menu, for our 2.5 year old twins. The owner also sent over a complimentary appetizer. The pasta was handmade and delicious. We were very impressed with the cuisine, and we are experienced with cuisine in Italy having lived in Italy for three years. The owner evern made our girls mini samdwhiches to go with the meats and cheeses we were too full to finish from our appetizer. Highly recommend! I have been a tour manager in italy for 9 years and I would rank this dinner amount my better experiences. We will return. Massimo was fantastic.